The most effective way to market products and services is to define your ideal customer, and craft your marketing message to that person. Many savvy marketers will actually create a persona of the ideal customer. This helps them focus their message, and aids in creating a clear message. Personas are fictional characters that represent the gender, demographic and socioeconomic level of your ideal customer. If you are unaware of how to create a persona, there are many articles that can help, and I highly recommend developing marketing personas for your business. HME retail stores face a fairly complicated issue when identifying their target market in order to develop a persona. A common misconception is that the ideal customer is the person who is aging in place at home. That is only half true. The person who is aging in place at home is the target USER of the product but often is not the target buyer. The caregiving is often involved in making the purchase. So should you craft your marketing messages for the caregiver? Probably, but keep in mind that the caregiver and the user will most likely consult with one another before the final purchase is made. The caregiver is most likely a woman, born bet ween 1952 and 1972. Yes, she is probably a baby boomer, but you will increasingly find members of Generation X in this group. Women who are between 45 and 65 manage 70 percent of all caregiving, and 91 percent of them report caring for one adult. While baby boomers will likely research product information online, they value face to face communication and will often place more trust in an actual conversation in your store than information provided online. Even so, reviews are very important, so make sure that you are managing your online reputation. The caregiver prizes individuality and freedom, this means stocking products in your store that don’t look like plain medical devices. Helping the caregiver understand how a product will relieve responsibility or create safety and freedom is critical. Neither generation appreciates gimmicks or hard selling. Instead, you should be an expert on their needs, and counsel with them regarding the best solutions. 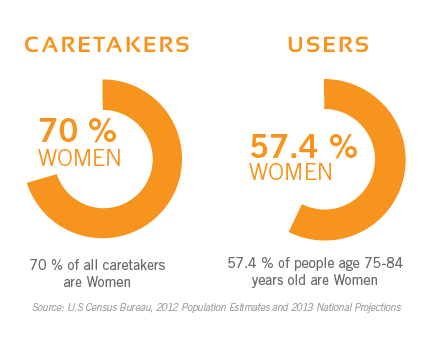 The woman being cared for, or the “user” is most likely born between the 1920s and 1945. They seek value, which doesn’t always mean that they want the cheapest option if the quality is low. They appreciate getting a good value for the money spent. They seek a sense of belonging, which is why this generation, more than any generation of the past, is eager to age in place at home. They want to stay in the home they raised their kids, and where their memories are. When looking at solutions to help them age in place, they will prefer options that don’t require large remodels. Luckily, there are some common factors between these two target customers. They are both most likely to be women, so make sure your marketing is sensitive to a woman’s sensibilities, and needs. Both target customers want products that are high quality and a good value. They are both looking for solutions that can blend into the décor of a home rather than being disruptive to the home’s look and feel. Create your store’s personas, and make sure that marketing and sales tactics appeal to both of these groups since they will most likely need to agree on the product before it is purchased.